BRYAN EATON/Staff photo. 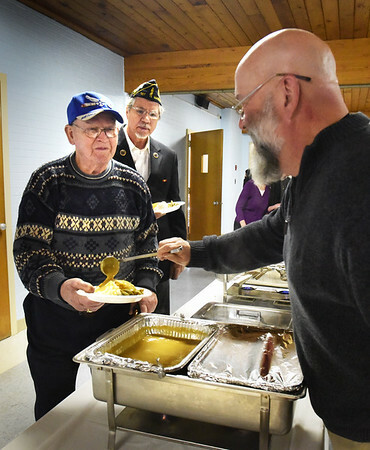 Volunteer Henry Goodwin ladles on the gravy for veterans Norman Bellavance, and Gary Eichenlaub of American Legion Post 187. The were at the annual Support Our Troop Christmas dinner, sponsored by Amesbury Veterans of Foreign Wars Post 2016 at Holy Family Parish Hall on Wednesday night.